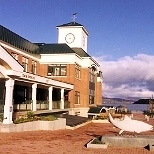 Pomerleau Park, located on Main Street near the train crossing, is nested on the lake shore connecting the boardwalk and walking path in Newport. The small park features shade trees, a decorative fountain, miniature mock lighthouse and benches to rest and enjoy the scenery. ​State Office Building to see photographs from the 19th and 20th century, an Abenaki timeline and more from our surrounding Kingdom.